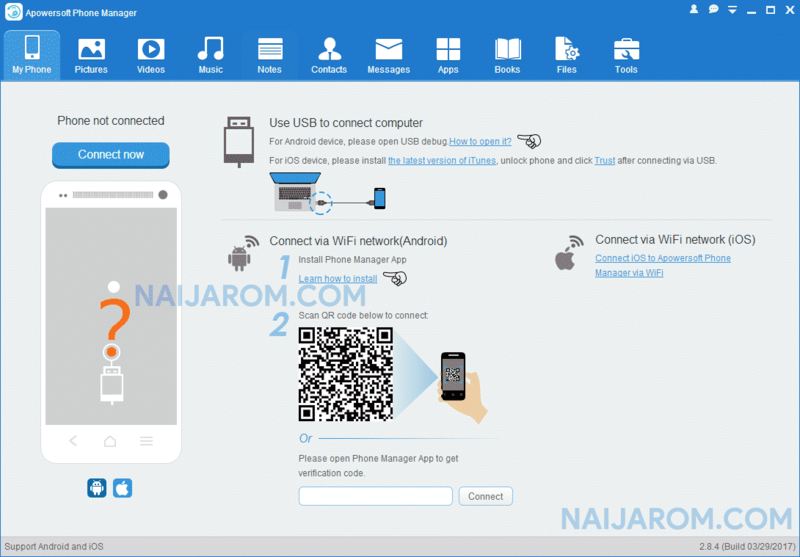 Apowersoft Phone Manager v2.8.4 is a small application for windows computer which allows you to manage your Android Smartphone and tablets from the Windows Computer. It allows you to transfer the pictures of your Android Device to the Computer or Send Pictures from Computer to the Phone. You can also batch delete the Pictures in single click. It allows you to Transfer Videos of your Android Phone to the Computer or from the computer to the Phone. It allows you to transfer Music Files from your Phone to the Computer or from the computer to the Phone. You can also listen the Music files of your Phone without transferring it to the computer. It allows you to check the Notes that you have created on the Phone from the computer. You can easily Modify or Add new notes on your Android device. In order to use the Apowersoft Phone Manager properly, you need to install the Universal ADB Driver on your Computer. Once Driver is installed you can successfully connect your Android Device to the computer, and launch the Apowersoft Phone Manager on the computer. [*] Credits: Apowersoft Phone Manager v2.8.4 is created and distributed by Apowersoft Team (developer). So, full credits goes to Apowersoft Team (developer) for sharing the tool for free.